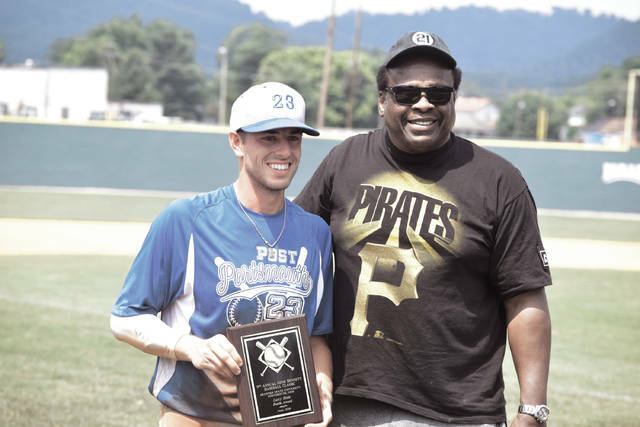 Post 23’s Cole Dyer grabbed the Al Oliver Offensive Player Award by driving in seven RBI and batting .500 (6-for-12) in GBBC Tournament play. 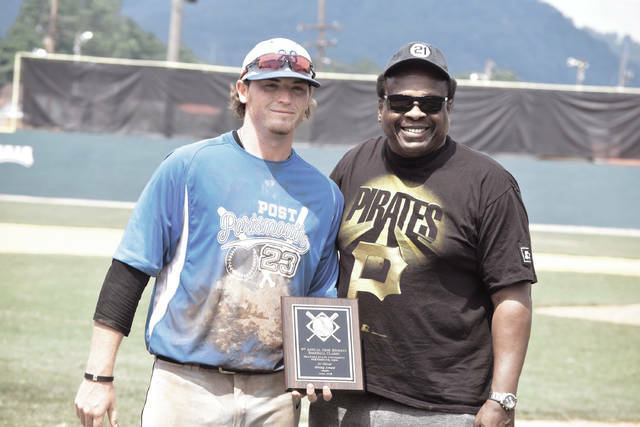 Post 23’s Kyle Gammon collected the Larry Hisle Hustle Award by going 11-for-20 at the plate with a team-best 11 RBI. Gammon also scored nine runs, stole five bases, threw four-and-two thirds innings in relief, and didn’t commit an error in the defensive infield. 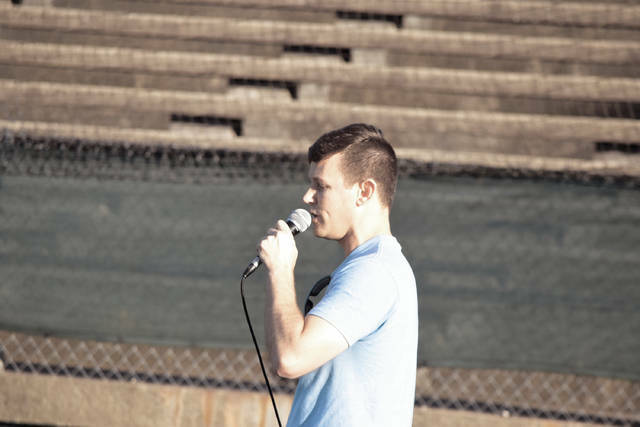 Bobby Blanton sings “Oh Canada” before singing the Star Spangled Banner on Thursday evening during the Opening Ceremonies. 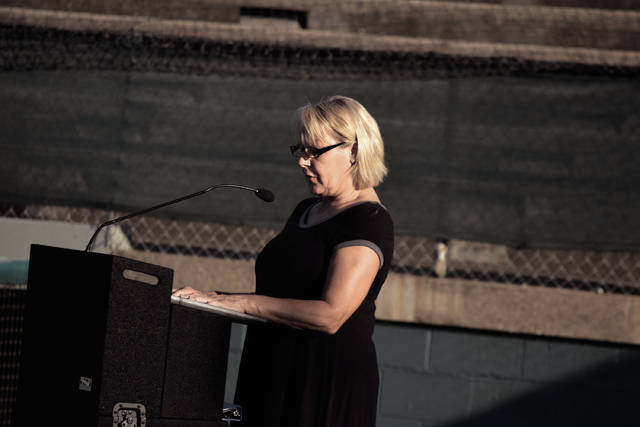 Cathy Bennett Jennings speaks during the Opening Ceremonies. When any person close to us passes, the questions always arise. How do we go on? How do we continue to push forward and be better today than we were yesterday? With the passing of Gene Bennett back on Aug. 16 of last year, those questions were amplified because the veteran of Wheelersburg and Cincinnati Reds lore — a lore that lasted 58 years with the latter and a lifetime with the former — was no longer around to present locals with the wisdom that many had sought out, and that Gene had graciously provided. But as the saying always goes, the show is one that must go one. And if one were to have seen the show, it couldn’t have been scripted much better. Portsmouth Post 23 and Ashland Post 76, which are revered as two of the most legendary American Legion baseball programs in the entire region, went a combined 11-2 over the Ninth Annual Gene Bennett Baseball Classic, with the former reaching the GBBC Tournament’s Championship Game. Cathy Bennett Jennings gave away free copies of Gene Bennett’s well-known book, “Gene Bennett: My 58 Years with the Cincinnati Reds.” And last but not least, the Great Lakes Canadians, a team that Gene had helped introduce to the tournament field back in 2014, took home all the marbles over Post 23 by a 5-4 tally in a well-played title bout. So, was the tournament successful? Resoundingly so. The way that Post 23 and Post 76 played throughout the tournament certainly would’ve pleased the former Cincinnati Reds’ minor leaguer and scout. Overall, the duo combined to outscore their opposition by an astounding count of 103-44 en route to posting the 11-2 mark. Post 76’s long journey, which resulted in a semifinal, was only ended by a 9-7 loss to Post 23, and Portsmouth Post 23 only trailed three times over the entire tournament — including two times in the title game, where Post 23 overcame a 1-0 deficit en route to taking a 4-1 advantage before giving up four unanswered runs to end the bout. Post 23’s work, which was led by third-year coach Matt Miller, was especially impressive considering the short time that Cole Dyer and Kyle Gammon had to get acclimated to the unit. Gammon, in particular, had only five days to mentally prepare himself for play after Greenup County was knocked out by Hazard in the KHSAA State Baseball Tournament, but followed by notching a team-high 11 RBI over seven games. Dyer, by himself, drove in seven RBI for the tournament. Both won the Larry Hisle Hustle Award and the Al Oliver Offensive Player Award as a result of their play. As special as the play was on the field, the off-field exploits were just as wonderful to witness. Alongside Gene’s daughter, Cathy Bennett Jennings, and trusted family friend, Richard Roe, the Wheelersburg girls soccer program controlled the pace in the concession stand. The Shawnee State University baseball program had everyone ready to play seven innings with their work on the field in between games at Branch Rickey Park. And there sat the very frame that had Gene’s No. 61 jersey in a frame with pictures reminiscing on the memories of yesteryear. It all exemplified hard work, dedication, and passion — three qualities that made Gene Bennett the respected baseball mind, and friend, that he will always be remembered as.